Added on June 30, 2013 by Daniel Kuney. As an early adopter, I’ve been singing Citi Bike’s praises since I received my key. The city has never felt smaller since I can hop on a bike and whiz across town in less than fifteen minutes, or bop between Union Square and Times Square without standing on a crowded subway platform. But as the program has grown, it’s become harder and harder to actually use the bikes. On Friday I told a friend in Brooklyn that I would take a Citi Bike from Manhattan and visit her. I went to three different stations and found nothing but out-of-service bikes - even though the app indicated that all three stations had available bikes. I thought about going to a fourth station but I gave up and took the subway. And therein lies the rub. What is Citi Bike supposed to be? 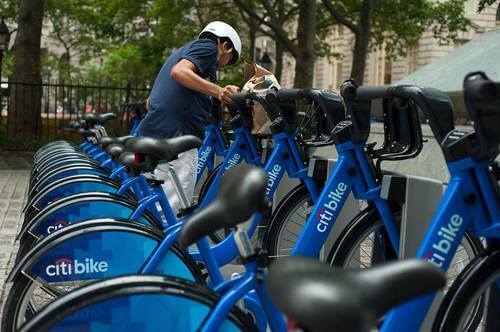 The mayor and Janette Sadik-Khan have touted Citi Bike as a brand new mass transportation system for the city. So, just like the subway, I should be able to use the system during regular working hours and outside of scheduled maintenance without worrying too much about bike availability. Before Citi Bike if I had to take the subway to see a friend I could do so without having a back-up plan. Yes, on occasion a station is closed or a train is delayed. But Hurricane Sandy withstanding, I can’t recall a time when I planned to take a subway to my destination and couldn’t. But the same can’t be said of Citi Bike. It works sometimes, but not enough that I always know it’s going to work. And is it really okay to have a transportation system that one can’t fully rely on? This afternoon I’m supposed to visit another friend in Brooklyn and I plan on taking a Citi Bike. But I won’t actually know if that will happen until I arrive at a station, or two, or three. I’ve also noticed problems with inventory management. The station nearest to my home is almost always empty, but the station a few avenues over is sometimes too full to receive new bikes. I first noticed this on Monday and I figured someone would analyze the data, see the problem and move some bikes from one station to the other to fix the imbalance. But as of Friday that didn’t happen. For a system built on big data, it’s not entirely clear if someone is looking at the data to solve inventory issues. I’m still willing to cut Citi Bike a lot of slack. If it truly is a brand new mass transportation system, it’s working remarkably well for something that almost literally sprung up overnight. And I’m hopeful that over the next few months the problems with broken bikes, availability of bikes, and the accuracy of the app are resolved. But if they aren’t, how much longer do I want to grab my helmet and head out to the bike station only to wind up on a subway?